Cardboard Citizens are a remarkable success story, especially dealing as they do with those at the sharp end of society, the ones who have fallen through the cracks. For 25 years, Adrian Jackson, CC’s founding father has pioneered theatre that will not let us forget what it is like to be homeless, to have lost everything including your dignity and identity. Taking Augusto Boal as an inspiration, Jackson has also pioneered Forum Theatre, a process that engages audiences – particularly young audiences – in getting actively involved with a story, be it about bullying, the benefit system or social media. I’ve seen it in action and it works a treat. Now here they are, setting up an even more impressive `first’ at yet another new south London venue, the Bunker Theatre, situated in an old underground car park next to the Menier Chocolate Factory. Focussing on housing – and Cardboard Citizens has always had homelessness at the heart of everything it does – Jackson is presenting nine plays in cycles of three plays with a whole network of additional talks, exhibitions and walking tours alongside the Festival. I would love to have seen all nine. 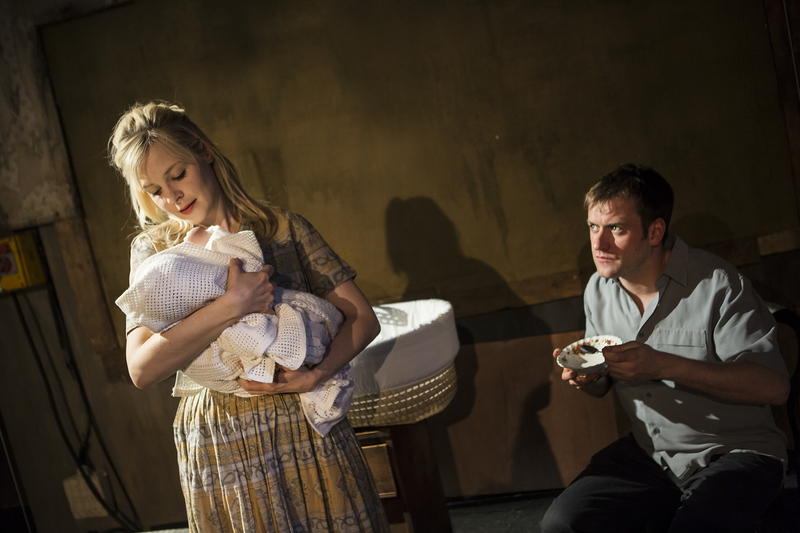 But the cycle of three I did see, Cycle two, with plays by Lin Coghlan, Nessah Muthy and Anders Lustgarten, were enough to show the quality and standard Jackson and associate director Caitlin McLeod are providing. And Housing could hardly be more topical. Given we are living through one of the most acute housing shortages and crises in post-war history, the greatest glory of Home Truths is its historical perspective going back over 100 years. Anyone coming to these plays is going to be given a lesson – a humorous as well as passionate and brilliantly argued lesson – in how we’ve got where we are. All of us may have been part of the ongoing story. None of us is `clean’, in a British society that overwhelmingly prioritises property ownership rather than, as in France, rental. All of us may in one way or another, out of self-interest or survival, contributed to the present crisis. 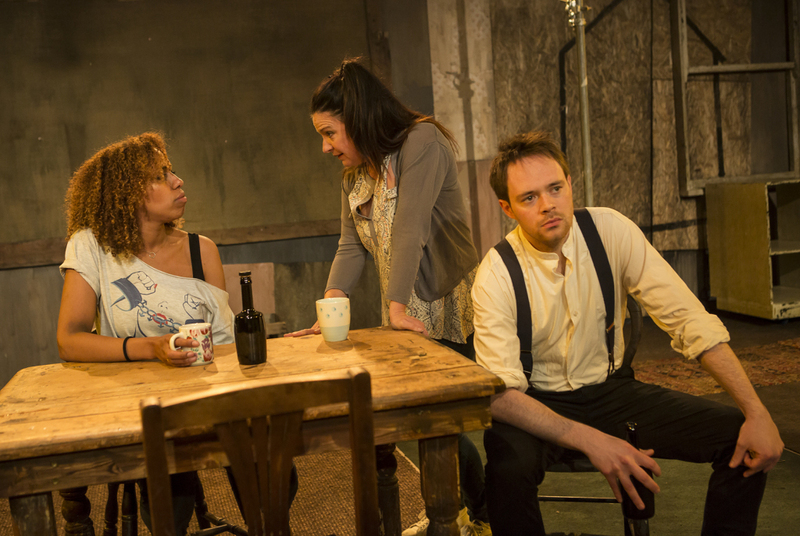 What the three plays I saw, Coghlan’s The Table, Muthy’s Put In The Schwarzes and De-Stat It and Lustgarten’s The House With The Yellow Front Door give us are the political values, principles and the need for a sense of identity that have driven this desire to `own’. Coghlan cleverly zigzags between post WW1 and now over one object, a table in a house where initially socialist activist, Eddie, delivers withering diatribes about the need for socially responsible housing and `homes for heroes’ while his pregnant Irish wife sees their individual family needs as paramount. The two contemporary inhabitants, an estranged lesbian couple, manifest different arguments pertinent to today’s perspectives. Dovetailing the two provides a penetrating reminder of what we take for granted today whilst also underlining the individual against the collective responsibility. Muthy’s Put In The Schwarzes which touches on Rachmanism and some of the first Windrush arrivals also applies a similar parallel technique to show principle under pressure from economic temptations feeding into racism. 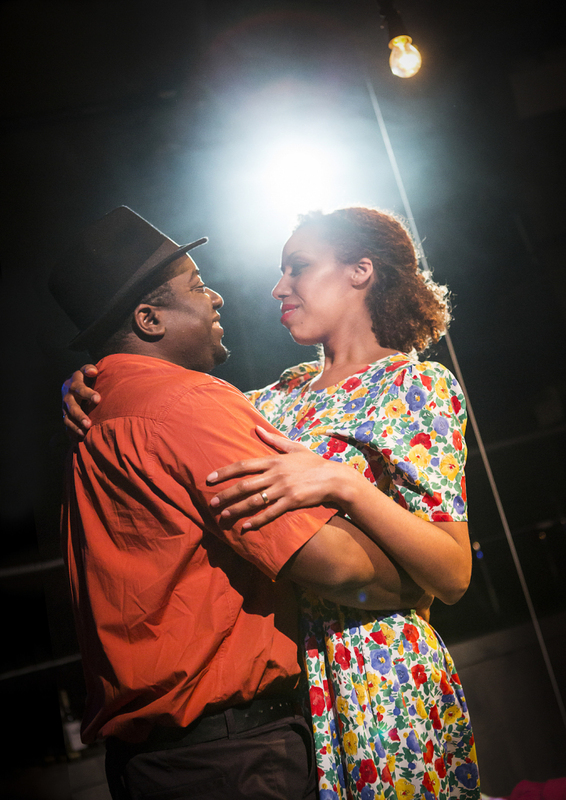 © Pamela Raith, Ande Skeete and Endy McKay in Nexxah Muthy’s Put In The Schwarzes And De-Stat It, Windrush couple finding it hard in Britain’s 1950s `motherland’. Lastly, Lustgarten with characteristic force takes as his starting point, Thatcher’s `Right To Buy’ as a lesson in how the deregulation frenzy and atmosphere of the 1980s made victims of the gullible. © Pamela Raith, Anders Lustgarten’s The House With The Yellow Door. 1980s Britain, generational differences between son and father. David Hartley and Jake Goode, on `making it’ and property as commodity. Hefty morsels to chew on, Jackson humorously interleaves British Pathe clips between the plays creating an atmosphere along with his versatile cast that lightens what might otherwise threaten to become too doctrinaire or polemical. 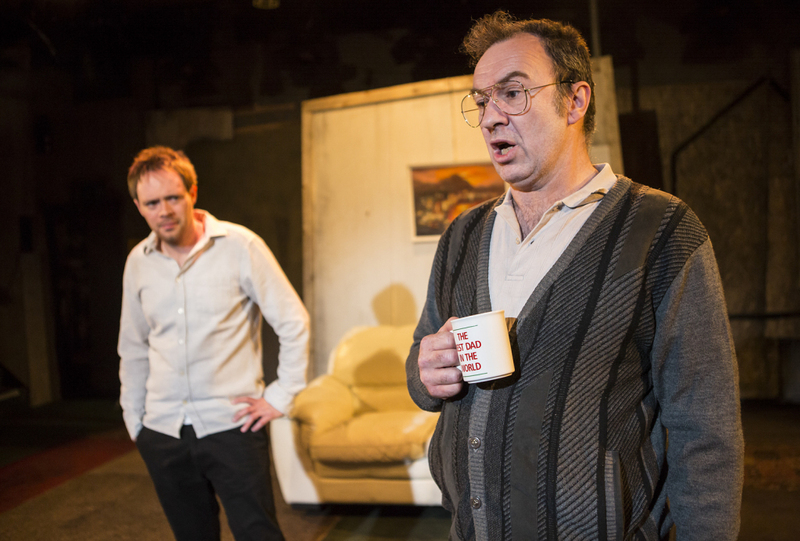 Overwhelmingly, these plays remind us, There is such a thing as `society’, after all. No wonder Cardboard Citizens have the blessing of Ken Loach whose Cathy was revived by CC last year. CC carry the same imprimatur of incipient fury at the state of our society and as a correction to its materialism. Worth seeing the lot and catching some of the many accompany events. Adrian Jackson and his team are an absolute national treasure. Lee Awanah, Miguel de Barros, David Fasan, Warren Heyes, Chris Holland, Ian Kalman, Phil Philocratous, Ann Regis, Brandon Richards, Paul Singer, Floria Twyman, Udeme Udofah, Ben Usher, Sasha Winslow. Presented by Cardboard Citizens with funding from Arts Council England, Big Lottery Fund, Jerwood Charitable Foundation, Cochayne, The London Community Foundation, Pret A Manger, Derwent London, The Leche Trust, The Golsoncott Foundation and the Goldsmith’s Company. 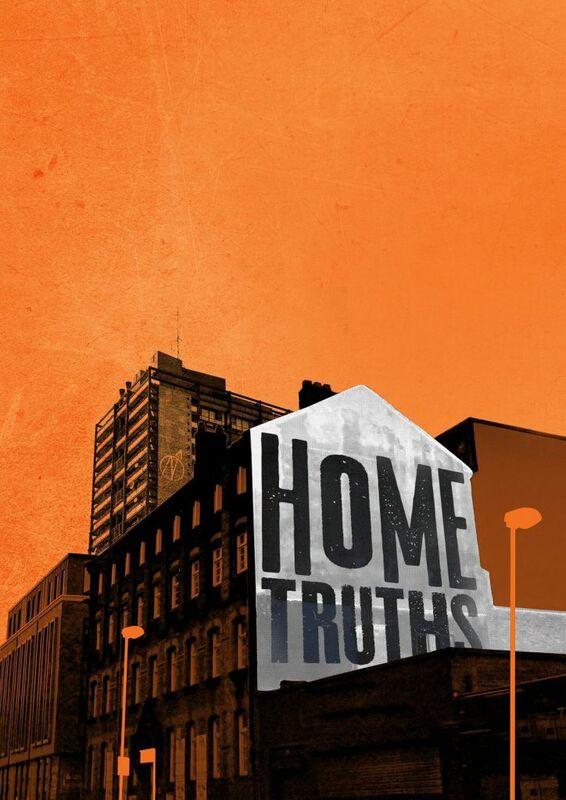 Alongside the Home Truths season, Cardboard Citizens are running a free festival further exploring the history of housing. The Festival runs to June and includes talks, exhibitions, a walking tour, film nights, pre and post show talks at The Bunker and other events taking place across London. Made possible by funding from the Heritage Lottery Fund.